Food Blogga: Want to Lose Weight? Forget New Year's Resolutions and Start Making Soup. Want to Lose Weight? Forget New Year's Resolutions and Start Making Soup. New Year's resolutions. They're nothing but bunkum. "Resolve to lose weight." It sounds real enough. It's a statement made in the dark of winter when we are most vulnerable. The holiday season romanced us with its twinkling lights, sparkling cocktails (can you say 400-calorie-martini? ), and carb-heavy desserts. We indulge. We regret. Then on January 1st we commit to a diet. By January 10th, most of us (read I) rummage through the pantry closet for something, anything chocolatey, salty, sweet, or preferably all three. We spot the bag of blue corn tortilla chips hidden behind the oatmeal and tell ourselves, "These are pretty healthy." We eat a few. Close the bag. Re-open it. Eat a few more. Next thing we know, half the bag is gone. Then we're thinking, "Well, hell, I already ruined my New Year's resolution. I might as well eat 'em all now." If any diet worked, then why do magazines promote them on their covers every month, every year? Because they know that we are fallible and that living a life of extremes isn't attainable for most. Consider some of these weight loss claims from popular women's magazines: "Melt 10 LBS Fast!" "Shed One Size! In Just 2 Weeks!" "Shrink Your Belly!" And these are just the ones on my coffee table. I say, "No." No to fast fixes, unrealistic goals, and tasteless foods. No to diets. I say, "Yes" to moderation. After 30-some-odd years, I have found that it's the only way for me to stay healthy and fit and sane. I eat all foods, but in moderation. I eat meat and cookies and drink an occasional martini. I also exercise regularly, in moderation; most days for 30-45 minutes. I spent too many years obsessing about my weight, about exercise, about eating. My resolution this year is to live life, enjoy food, and stay healthy by forming and maintaining habits I can realistically sustain. I also resolve to eat a lot of soup, which will be easy. Broth-based soup filled with veggies are nutritious and filling. Studies have shown that people who eat 1 1/2-2 cups of vegetable soup before a meal consume about 135 fewer calories at the meal. Lately, I have been eating my Easy Butternut Squash and Kale Soup. It's chock-full of vitamin-rich veggies and fiber-rich beans. 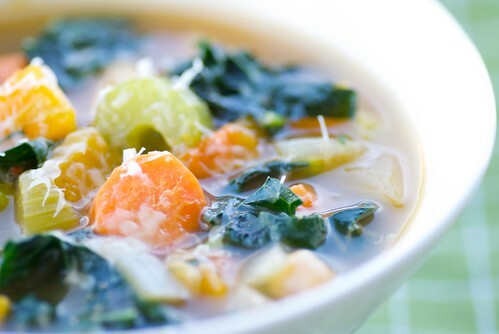 With both winter squash and dark, leafy greens at their peak, this soup is ideal for the cold winter months. Sure, I eat pretty well, exercise, and eat a lot of soup. I also have bad days when I feel awful about the way I look or regret eating mindlessly. But I know that eating well is more than just a resolution. It's changing the way you think about food and giving yourself healthy yet delicious options from which to choose. That's why foods like soup are so great to have in the house -- if you've taken time to make something healthy and delicious, it's a whole lot easier to eat something that will make you feel good about yourself. Note: This is a vegetarian soup. If you omit the sprinkling of cheese on top, then it's vegan. 1. In a large pot over medium heat, warm olive oil. Add onion, carrots, and celery, and saute 5-7 minutes, or until lightly browned. Add the squash, chickpeas, and broth. Bring to a boil. Reduce to low and cook 5-7 minutes, or until squash is tender but not mushy. Add kale, crushed red pepper, and salt. Heat through, about 3 minutes. Stir in herbs. Taste it, and adjust seasonings as desired. Serve hot, garnishing each bowl with a sprinkling of grated cheese. Great post. I'm in agreement. I have a few pounds to lose after the holidays, but I'm not going to worry about. Step up the exercise a bit and eat in moderation and it will come off. Soups are a great way to go. Warm, filling and nutritious. Can't wait to try yours! That's right! Your soup looks so colorful and sounds lovely! I think a lot of people have trouble shedding those few pounds is, food is too dam good. Irresistible. Excellent advise Susan!!! !Our goals have to be attainable. Thanks for the tip, the recipe, and the lovely "slurp-able" pics! I think you have a winning philosophy - not to mention a great winter soup recipe! This looks delicious and I'm on the same wavelength with soups. I've been making soup regularly lately. It's a great healthy, low calorie option (depending on how it's made). It's not about going on a diet, it's about changing your diet. Soup is a good way to get back on track. Good post, Susan and thanks for the recipe! Agreed! I have slowly but surely shifted my diet to one of whole foods, a LOT of veggies, and in winter, a lot of soups. And I finally found a workout routine that I stick with. (I've stuck with it for 7 months; it's a habit now.) I wouldn't say I'm much thinner than I was beforehand, but I'm healthier. I have more energy, I am not sick often, and I'm at an appropriate weight for my height. I feel healthy, and even though I too have days where I criticize every bump, dimple, and roll, I still remind myself that I feel good, and that makes all the difference. This soup is right up my alley - with a few gluten-free crackers, this would be a wonderful meal! My wife and I have been attempting the shedding of pounds by going the vegan route. this will be a nice addition to the recipe collection, thanks! Very good advice. I too, love soups! Will have to try yours because of the butternut squash. looks delicious! thanks for the link back, too. Another delicious way to consume one of my favorites... butternut squash! We've been eating a lot of soup this winter - they're filling and conforting! Great post! Moderation is the key to a happy and healthy life. And I'm a firm believer that its the only way to keep a steady healthy weight. I'll be trying your recipe this week! I'm with you...moderation is the key. Great soup. Great post... all so true! Moderation is key! this is a great post. i love soup, and this one looks delicious. i do have to loose a few pounds after the holidays too...i cannot fit into my favorite costume! I always say that the problem with a resolution to lose weight is that it's an outcome, and one that you ultimately only have some control over. My healthy resolution is to get at least 3 servings of vegetables a day. (I like vegetables, but it's easy to let them fall to the wayside). I can control whether or not I do it, and if I lose weight as a result, that's a bonus. Plus more veggies for me! Looks delicious! I'm determined to lose some weight, I know its a cliche, but your soup will be a great weapon in my arsenal! I have been making soup like mad. I made a mushroom barley soup last week that really hit the spot. I can't wait to try this one! Thanks! Oh, that looks like just what I need (and exactly the kind of thing that hubby loves!). So true what you say about moderation - it really is the only sustainable way. Someone said something so true to me the other day: we all panic about what we eat between Christmas and new year, but we *should* be panicking about what we eat between new year and Christmas!! I've learned in the past year that if I want to stick to a plan, I have to really take a stand about food that's bad for me. You see, I'm REALLLLY stubborn, and when I take a side on something, I take a side. I am using that to my advantage. "Don't eat that! Bad for you! Bad for the planet! Bad for your waisteline! Will ultimately cause your untimely demise!" So far it's working. But the soup thing works pretty well too. You and I seem to be on the same page. At the end of December I made a HUGE pot of stock and froze batches of it. I'm making a new soup weekly for my lunches. Soup is a fun experiment, as your post so beautifully illustrates. Love this post, love the philosophy. I'm probably going to try some variation of this stew tonight! Terrific post! Amen to it all. Losing weight is my resolution every year, but I soon drop it, but not the weight:) Your soup sounds very healthy indeed. Soups are one of my favorite parts of a meal. Thanks for the recipe. Happy New Year! Susan - looks GREAT! Am always on the lookout for recipes for Kale... We get a ton of it in our organic deliveries. I agree about soup too - I need to make myself a few batches so I always have homemade soup on hand - soooo much better than most store bought. Thank you for the wonderful recipe. When it comes to loosing weight what you eat is just as important as how much your exercise. Yes I want to lose weight, yes, I had to many goodies! 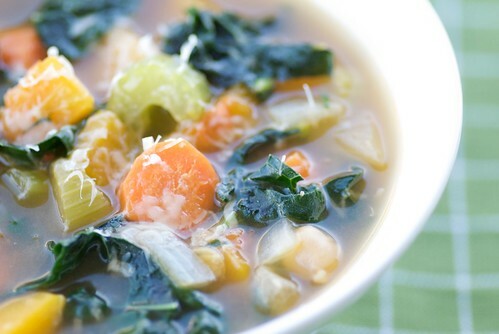 I will make this soup, because I have a bunch of kale in my frig and a butternut squash sitting on my counter! Thanks Susan! Amen. Soup is it! This one rocks. I agree. Soup is very filling and a leftover that doesn't make u feel like its leftover. I make a potato, kale/chard, and whatever else is in my fridge soup that is very similar to yours in seasoning. It freezes well except for the taters. Will have to try the beans like you did. Great Post! !I agree with every word for it. Awesome post Susan- and you are so right- I did this 2 years ago -had soup everyday and I did lose weight.I felt wonderful- I am starting again- thanks for the reminder! This soup is fantastic! I loved it, and even my friends (who aren't necessarily veggie lovers) raved about it. So...I, um, well....I don't like soup. Does that mean I'm SOL? Wow, this is definitely a staple in my soup repetoire. Thanks, Susan! violetgal-Oh, I'm so pleased to hear that! Swiss chard is ideal. I've made this soup with many different greens including spinach and escarole. Thanks for letting me know that it freezes well too. I've never done it. Cheers!